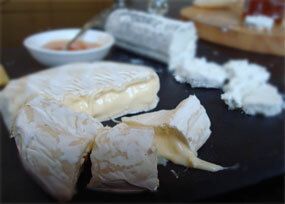 Ah cheesey friends I have been in a conundrum, a cheese conundrum – what does a curd nerd to take to a cocktail party? I couldn’t recall 007 eating anything with his Martini and Audrey Hepburn certainly just seemed to smoke. But I wanted to make some sophisticated cheese canapés to hand around. A bit of research later and a whole new world opened up. So over the next few weeks I’ll share a few easy canapés to grace any cocktail party. Cocktails are intense with strong flavours, so I wanted canapés that could stand up to high alchohol beverages. I also wanted them to be easy to assemble or pre-prepare and something that would match a range of drinks. Here’s the first of my party time recipes. I tend to take an ‘assemble not build’ approach especially when it comes to a party, but of course you could make the ginger bread from scratch. 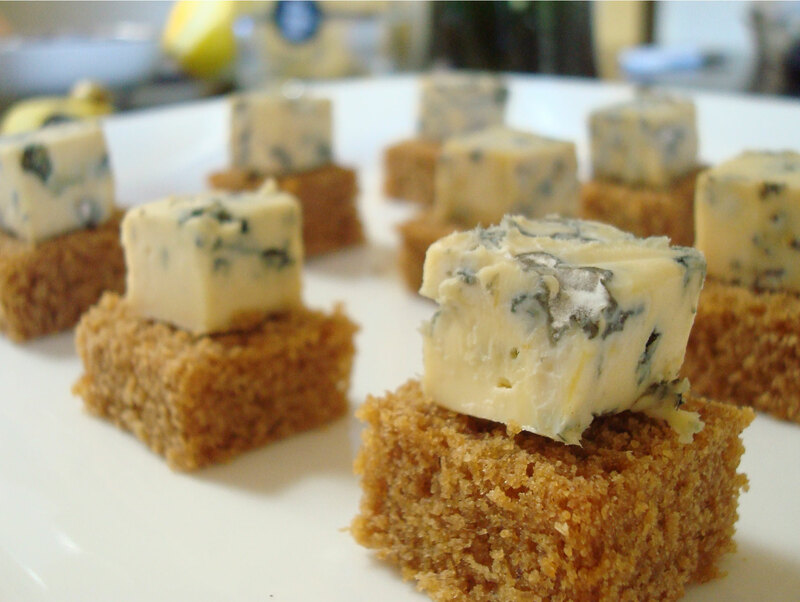 Blue cheese and gingerbread cubes. Sweet and creamy with a kick of spice, these little beauties pop into your mouth with narry a need to put down your drink. Everyone loves them, their symmetrical regularity providing the cachet that a canape should. The ‘recipe’ was shared with me by a friend who’d been at a Ruth Pretty-catered do. I use Kapiti Kikorangi cheese. It holds its shape, is easy to find and not too pricey. It also has a great bright blue, that looks pretty against the caramel tan of the gingerbread. I usually use Loaf Tripple Ginger Loaf, but as Moore Willies was out, I used Aunt Betty’s from the regular supermarket. Surprisingly good. You want a dark gingerbread with bits of caramelised ginger included. Just cube your gingerbread – I made rectangles about 1.5 cm square. Cut a slightly smaller square of blue cheese. Assemble so they sit like pretty pyramids atop a big white platter. Easy and stylish! These paired well with Martinis, their flavours strong enough to balance such a potent cocktail. The caramel flavours also made them a favourite with the Long Island Ice Tea crowd and the smattering of beer drinkers. I’d also give Whisky and Rum based cocktails a go and of course a sweeter wine. So Cin Cin my dears, next week some Fennel seed and Apple Cheese Straws. A great new staple in my party repertoire. Oooh Lucy. They look fantastic. I love party food. I am so going to try that! Mmm yeah these always go! Great post Lucy. 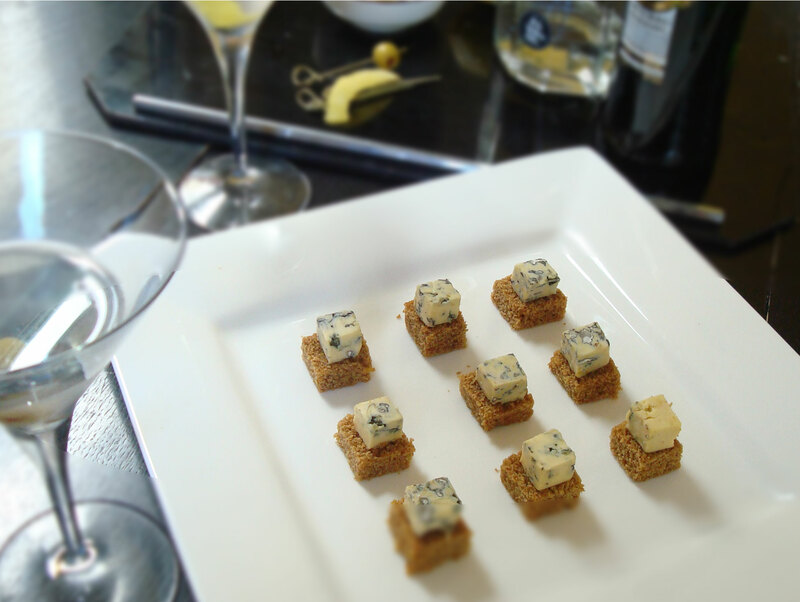 Blue cheese and ginger bread – what a great combination. Thanks Heather. I’m thinking of tying blue cheese with a walnut and date loaf.